Japanese Cuisine and Foods | Travel Japan by H.I.S. 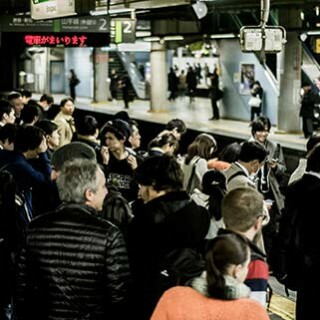 Tokyoites are known for their preference for eating out and there are more than enough restaurants to satisfy them. Almost every kind of cuisine in the world is available, and eating establishments range from 5-star quality to modest vendors in stalls (they are safe) around the stations. Fast food chains are also represented in force, both local and international ones. Most moderately-priced restaurants still have plastic models of what they serve in the window, and most traditional-style Japanese restaurants still specialize in one kind of cuisine. Many coffee shops serve set breakfasts and lunches, while standard restaurants, which serve dishes with elements of both western and Japanese foods, have reasonably-priced luncheon sets. Department stores invariably have a restaurant floor with a variety of Western and Japanese restaurants usually toward the top and their basement food floors and larger supermarkets have prepared foods to go. Truly fine restaurants are now plentiful and several world-renowned restaurants have opened up branches in Tokyo, although the smaller bistro type can be equally as delicious. Edomae-zushi consists of a small ball of rice with a slice of fish or other topping, and it uses fish caught in Tokyo bay. Edo means Tokyo and Edomae means Tokyo bay. The typical Edomae-zushi has tuna, cuttlefish, bonito, shrimp, etc. Edomae-zushi is like a ship's bottom in shape and it is bite size. Edomae-zushi was produced about 170 years ago. Sushi was a kind of fast food, sold from small booths around the city, and it rapidly became popular because it could be prepared quickly. This was important to people living in bustling Edo (old name for Tokyo). 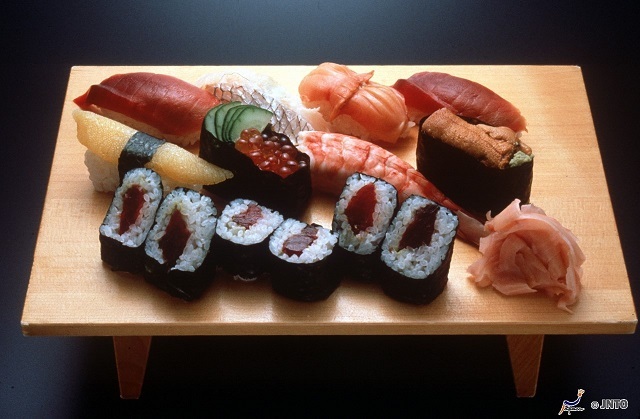 Today, the popularity of sushi has spread not only within Japan but all over the world. Tempura is food deep fried in oil after being coated with a mixture of egg, water and wheat flour. Among the ingredients used are prawns, fish in season, vegetables and dried seaweed. Tempura is eaten hot with a specially prepared soy sauce flavoured with grated daikon radish and ginger.Although there are various styles, the rich, nutty type fried in sesame oil is called Edo-mae (Tokyo-style).Tempura was brought to Japan by the Portuguese in the late 16th century. Today, tempura is a very popular Japanese food, as well as the most renowned outside of Japan. Soba noodles are native Japanese noodles made of buckwheat flour (soba-ko) and wheat flour. They are roughly as thick as spaghetti, and prepared in various hot and cold dishes. 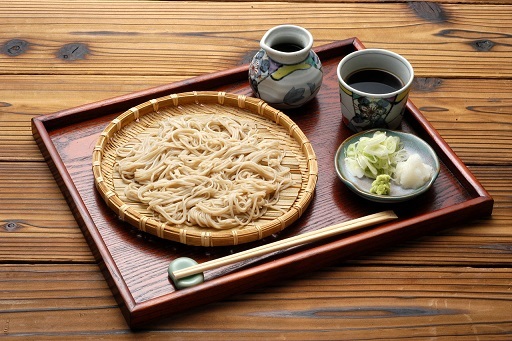 The most basic soba dish is 'zaru soba' in which boiled, cold soba noodles are eaten with a soya based dipping sauce flavoured with 'wasabi', grated daikon radish, and finely sliced green onions. Soba is a simple food, but has plenty of vitamins B1 and B2, as well as rutin and choline, and a growing number of people now see it as an excellent health food. Oden is a popular Japanese hotpot dish, which includes daikon radish, fish cakes, boiled eggs, 'konnyaku' (yam cake), and other ingredients. 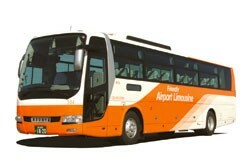 It is originated in Edo (old name for Tokyo) roughly around the year 1850. These ingredients are simmered in kelp-based stock for hours. It is usually cooked in a big ceramic pot at home. It is fun and warm to eat oden around table with others. Oden is even sold in convenience stores too. Japanese love oden! Also, as the autumn arrives, many oden' yatai' (stalls) begin their business around train stations and entertainment districts. A yatai usually has a small counter with a few chairs. It is inexpensive to eat in any yatai. Businessmen on their way home from work often stop at oden yatai and sip sake. People order their favourite ingredients from a large oden pot with beer or sake. You can eat oden at Izakaya bars too. Kabayaki is a delicacy especially favoured by the Japanese people due to its high nutritive value and mouth-watering taste. The prepared eel is skewered, steamed to remove excess oil and then placed over an open charcoal fire repeatedly dipped into a special sauce during the broiling process. The fat dissolves, leaving meat that's fluffy and light. The sauce is a mixture of soy and 'mirin' (rice wine). For a piquant touch, gourmets sprinkle the green spice 'sansho', which has an enigmatic but lemongrass-like aroma. Unagi kabayaki remains an eternally simple and divine dish. 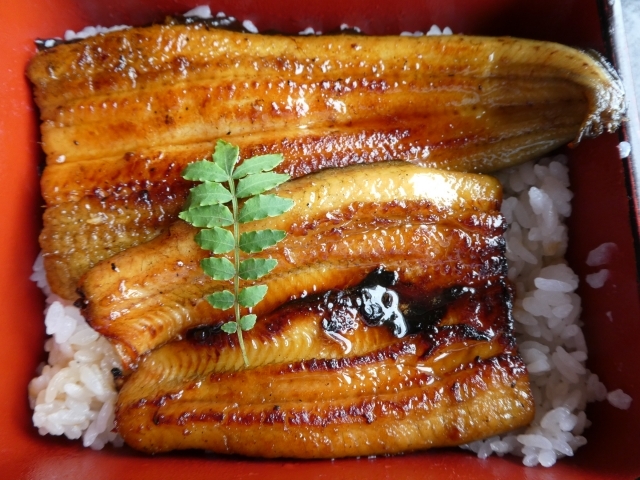 Unagi is traditionally consumed in the summer months to fortify the body against fatigue during the hot weather, usually served in a box over a bed of rice. There's a cluster of unagi specialists in Asakusa and Ryogoku. Monjyayaki is similar to crepe made from seafood, cabbages, and meat, and it is loved by people who live down town in Tokyo. The word 'chanko' represents any type of food that sumo wrestlers eat. In general, there are two types; the 'yose-nabe' and 'chiri-nabe'. The yose-nabe consists of chicken, fish, seasonal vegetables and tofu cooked in chicken broth and the chiri-nabe consists of seasonal vegetables and chopped fish cooked in broth but eaten by dipping the cooked ingredient in a vinegar and soy sauce mix. Chanko is very healthy and nutrient-rich food. Shumai is the famous food of Yokohama. Shumai is steamed Chinese pork dumplings wrapped in a thin flour and water pancake. Although shumai was originally Chinese food, shumai is famous in Yokohama. A famous boxed lunch made with Shumai is available at Yokohama Station.Yokohama has a famous Chinatown area, where many Chinese restaurants are located and many tourists visit. Chinatown is probably the reason for steamed meat dumplings being a famous food in the Yokohama area. Senbei is a crispy cracker made from rice. There are a variety of flavors, but senbei has roughly two types, sweety type and salty one. The main ingredient of sweet-taste senbei is a wheat flour and a sugar and egg, so it is similar to cookie or biscuit. On the other hand, salt-taste senbei is mainly made from rice and soy sauce. But now there are also a lot of senbeis with another seasonings such as 'miso' (soy beans paste), cheese, curry, salt, wasabi, chili and mayonnaise etc. Though you can buy packed senbei in any stores, it is worth trying fresh senbei grilled on the spot. Ningyoyaki is one of the most famous Tokyo confectioneries. It has over a hundred years of history. It contains 'anko' (sweet pasted sauce made from red beans) coated with light sponge cake. Each detailed charming face represents the seven gods of luck. Asakusa is known for ningyo-yaki. Kyoto offers an excellent range of restaurants, from delicate, elegant, Kyoto-style establishments to standard Japanese, Western, Korean and Chinese restaurants. Fast food chains, both Japanese and Western-style are also liberally situated in the more frequented area of the city. Kyoto-style cuisine, noted for its refined taste and artistic presentation, is a synthesis of three distinctive styles of cooking. 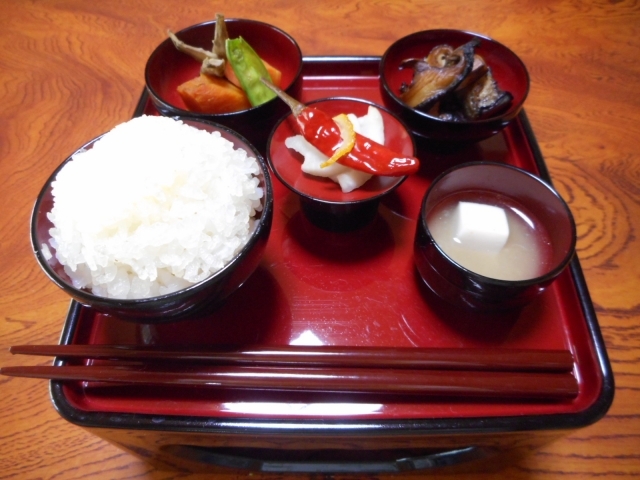 Kaiseki-ryori was developed as a simple meal served before tea in the tea ceremony. It is now served as the evening meal at most traditional 'ryokan' (inns) and at fine restaurants throughout Kyoto. 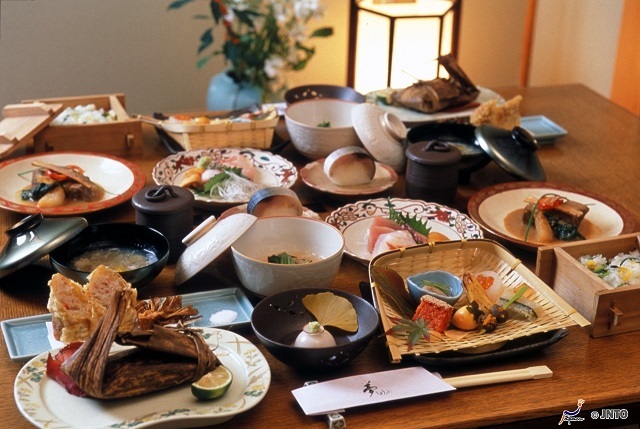 It consists of 'sashimi' (raw fish), seasonal vegetables, marinated food, soup, rice, grilled fish, pickles and sweets. It avoids strong spices and seasonings to maintain the original flavour of ingredients. The arrangement of dishes also plays an important part. The food is placed on plates and bowls, elaborately chosen and served in a most aesthetic and appealing manner. Great care is taken to ensure that the seasonal aspects, taste, and presentation of the food are perfect. In order to pursue their disciplines, Zen (Buddhist ) priests developed Shojin dishes at their temples, eating vegetables and avoiding food that has been killed, such as meat. The founder of the Soto sect, Dogen, is believed to have introduced Shojin cuisine from China to Kyoto in the Kamakura period. The dishes have a significant variety, using vegetables, raw fu, tofu, yuba, etc., and flavoured with vegetable oil, 'miso', ginger, etc. There is a saying that Osaka people spend all of their money on food until they go bankrupt". You will recognise when you see the enormous number of eating places packing the city's downtown area. Some restaurants are large, and others very tiny, but they all tend to be homely, friendly and inexpensive, though they may not be too sophisticated. 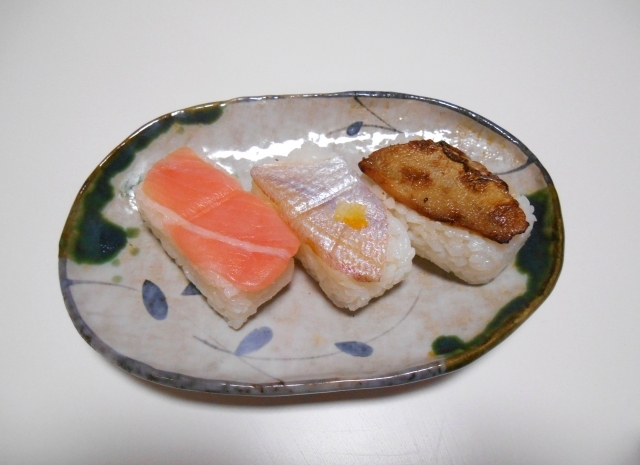 In contrast to Tokyo-style sushi, with its piece of raw fish on an oval shaped rice ball, Osaka-style sushi, usually called oshizushi or pressed sushi, is characterized by its square shape with vinegared fish or broiled conger eel spread on top of rice and pressed all together, then cut into little square pieces when served. 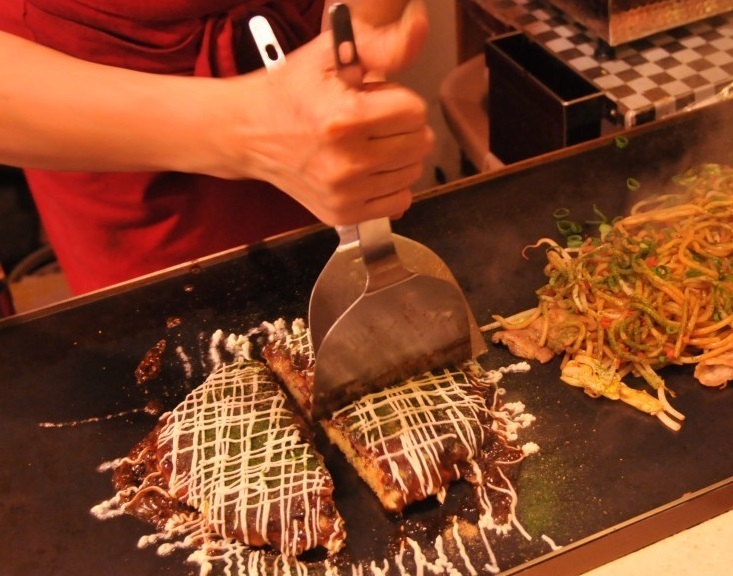 Okonomiyaki is a mixture between pancake and pizza. 'Okonomi' means "as you like". This refers to the ingredients that vary anywhere from fish, meat, clams, eggs, vegetables, fruit and pickles - almost anything and everything. Common ingredients would be thinly sliced chopped pork, thinly sliced chopped beef, chopped onions, octopus, squid, and mushrooms. You mix them together and then you pour it on a grill and let it cook like a pancake. As for toppings, the various sauces are used as well as mayonnaise, 'katsuobushi' (shaved dried bonito), and 'aonori' (dried seaweed flakes). Katsuobushi is so thin that it waves in the heat coming off the freshly cooked okonomiyaki and so it looks like the top of your meal is crawling. Takoyaki is a small round-shaped wheat flour dumpling made of batter, octopus, 'tenkasu' (bits of tempura batter) , 'benishoga' (pickled ginger) and leek, topped with brown sauce, 'aonori' (green laver), 'katsuobushi' (dried bonito flakes) and mayonnaise. It is cooked on an iron griddle with lines of holes into which the mixed ingredients are pured and then baked. It is the kind of food you can buy at a street corner stall. 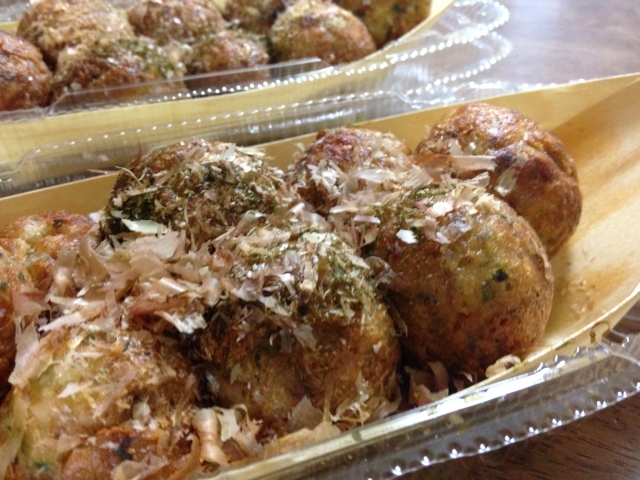 Takoyaki somehow embodies the atmosphere of Osaka and symbolizes the Osakans' spirit. As you might imagine, Kobe is a city famous for its international cuisine. There are a number of foreign restaurants catering to foreign residents to Kobe, where the genuine cuisine is exceptionally delightful. Especially in Nankin-machi, a bustling China Town just to the south of Motomachi Station, you can enjoy authentic Chinese cuisine. Kobe beef promises good taste by carefully selecting Tajima beef and other high-quality ingredients. 'Shimofuri' is the best part of beef, where fine veins of fat are delicately intertwined with fresh red fibers of flesh. When heated, the fat and the flesh are finely mixed to produce exquisite harmony of taste. Kobe beef attracts gourmets from all over the world, with variety dishes such as grilled steak, 'sashimi', 'shabu-shabu' and 'sukiyaki'. Kobe is the birthplace of many now nationally popular confectionery companies. All of them originated as small stores owned by foreign residents of Kobe selling their homemade cookies or candies.